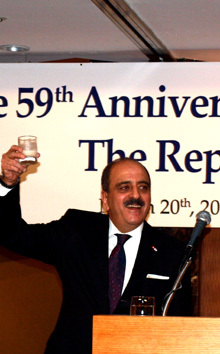 Tunisian Ambassador to South Korea Mohamed Ali Nafti hosted a reception at the Lotte Hotel in central Seoul on the evening of March 20, 2015 on the occasion of his country's 59th anniversary of independence. Tunisian Independence Day, which is the National Day, is the day Tunisia gained independence from France in 1956. A number of high-profile guests from nearly all walks of life attended the dinner reception, which lasted into the late evening. Among them were scores of top foreign envoys serving in Seoul's diplomatic community. Earlier on March 4, 2015 in a separate event the Tunisian envoy hosted a recpetion for the opening ceremony for the exhibition of Tunisian arts at the Korea Foundation Gallery in Seoul on March 4, 2015. The art exhibition ran from March 4 to March 12, 2015. On show were a variety of motifs and traditional handicrafts derived from the influences of the ancient Roman Empire in the North African nation. Scores of top foreign envoys, thier spouses, and local journalist were invited to the opening reception. 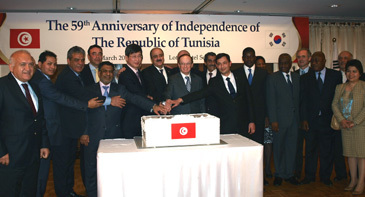 Tunisia was also one of the first African and Arabic nations to establish diplomatic ties with South Korea. On March 31, 1969 Tunisia and South Korea established formal diplomatic relations, opening embassies in each other capitals. But the actual relations began a year earlier in May 1968 when the two nations opened consulatesgeneral in the respective capitals. Since then bilateral relations have undergone a significant development. The two nations have been developing friendly, and practical cooperative relations based on economic cooperation. In particular, South Korea invites a substantial number of industrial trainees from Tunisia. South Korea also sends experts to the North African country. Meanwhile, Tunisia formed formal diplomatic ties with North Korea in July of 1975. In 1991 the bilateral trade volume stood at 23.2 million US dollars. Tunisia imported 15.8 million US dollars’ worth of goods from South Korea and exported 7.4 million US dollars’ worth of mainly aluminum to South Korea. But the bilateral trade volume increased to the whopping 380 million US dollars in 2010. Tunisia's imports were 345 million US dollars and its exports were 35 million US dollars. Main import items were railroad cars, passenger cars, construction equipment, synthetic resins, and cordless phones. Tunisia exported to South Korea such items as aluminium, textile and garments, wireless communications parts, and fish and meat. Currently some 180 South Koreans work or live in Tunisia. They are employees of LG Electronics, Samsung Electronics, Yura Corporation, and KOICA as well as other South Korean government officials and their family members. Tunisia wishes to induce technology and investment from South Korea. For details or inquiries call the Tunisian Embassy in Seoul at 790-4334/5.